Here's an easy way to transfer files from your old computer to your new one. 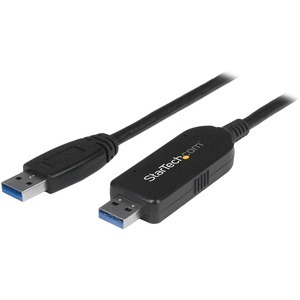 This data transfer cable lets you move files quickly over USB 3.0, and works with both Mac and Windows®. The transfer cable saves you time and effort when you're upgrading to a new computer. You can transfer your files and settings quickly over USB 3.0, also known as USB 3.1 Gen 1, with file transfer speeds up to 5 Gbps. Plus, there are no additional drivers to install when connecting your computers, because the necessary software is stored on the cable.